The EPA (Environmental Protection Agency [ USA ]) and the EEA (the European Environmental Agency) are both in clear agreement, NOx is bad for people’s health. The European Environment Agency (EEA) estimated that in 2015 over 72,000 premature deaths in the 28 EU member countries were a consequence of NO2 levels in the atmosphere. But NOx does not only mean NO2. NOx is a shorthand term referring to the oxides of nitrogen. Some of these are formed naturally, but the majority of the oxides that plague our atmosphere in our towns and cities are products of our society, and most notably come from combustion. At the high temperatures found in combustion processes, the nitrogen molecules in the combustion air (N2) are broken into ions, that then react with oxygen molecules (O2) to form oxides of Nitrogen (NO, N2O, NO2…). Of these oxides by far the most common that is formed during combustion is NO (nitric oxide). As it goes, NO is quite dangerous as it is. Exposure to nitric oxide gas in low concentrations produces an irritating effect on the mucous membranes of the eyes, nose, throat and lungs, which can include choking, coughing, headache, nausea and fatigue. But it does not stop there, The NO molecules react together with UV light and volatile organic compounds (VOCs) in the atmosphere. This reaction reduces the size of the VOC molecule and converts the NO to NO2 (Nitrogen Dioxide). NO2 is a particularly nasty air pollutant and causes significant respiratory problems even at the 40 – 100 µg/m3. The cycle continues as NO2 in the air reacts in the presence of oxygen and UV light to create ozone (O3). The same reaction also converts the NO2 molecule back to NO. The molecule of NO is now free again to find more VOC compounds to repeat the cycle. A typical VOC compound can recycle a molecule of NO multiple times (on average 5) before it ceases to be photo reactive. The gases that are produced during this cycle; ozone, NO and NO2 all cause respiratory issues, and at elevated levels can rapidly cause direct harm to tissues. NO is relatively harmless below 25ppm, but NO2 concentrations higher than 4ppm will already anaesthetise the nose. Although Ozone is desired in the stratosphere (the higher levels of our planet’s atmosphere) to help protect us from the effect of UV light, tropospheric ozone (that is ozone in the air that is closest to the earth’s surface) has been and continues to be a significant air pollution problem and is a primary constituent of smog. There is a great deal of evidence to show that ground level ozone can harm lung function and irritate the respiratory system. Exposure to ozone NO and NO2 is linked to premature death, asthma, bronchitis, heart attack, and other cardiopulmonary problems. In addition to these issues, there is strong evidence that NO2 also reacts with moisture to form nitric acid, which then in turn reacts with ammonia in the air to form minute crystals that are nucleation sites (points from which particles grow). These small particles and in particular the particles that are smaller than 2.5 microns (known as PM-2.5) can exhibit severe toxic effects in humans. In the EU the total number of premature deaths attributed to PM-2.5 is estimated to be over 400,000. Although not directly calculable, NOx emissions are contributing to these deaths as well. Clearly reducing NOx emissions will reduce the overall levels of NO, NO2, Ozone and Particulates, which in turn will lead to fewer premature deaths, and result in a significant cost savings to our health services and society. A recent study in 2015 by Kings College London suggests that the costs for NOx related premature deaths in London alone lie somewhere in the region of £1.4 – £3.7 billion. 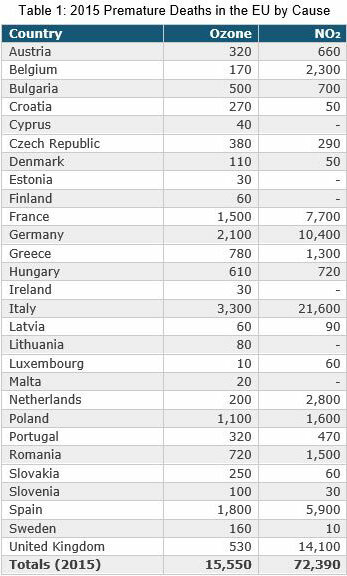 Extrapolating these costs to the European Union suggests an annual cost of £36 billion ( €46.58 billion ). To put this into perspective, the shared annual budget for the EU in 2015 was €145.3 billion in commitments from the member states. This means that the estimated cost of premature death due to NOx in the EU comes to a staggering 30+% of the total budget of the EU Parliament. It doesn’t stop there, as cost related to NOx emissions are not only related to premature deaths, but current scientific evidence also links short-term NO2 exposures, ranging from 30 minutes to 24 hours, with adverse respiratory effects including airway inflammation in healthy people and increased respiratory symptoms in people with asthma leading to increased visits to emergency departments and hospital admissions. Even if the numbers and costs quoted above are incorrect by a factor of 10, they remain staggering. If we believe these figures by any fraction, and I believe they are grossly understated because of the amount of researching being done, then, folks, this just might be a HUGE problem we are not addressing because of our ignorance of the problem.